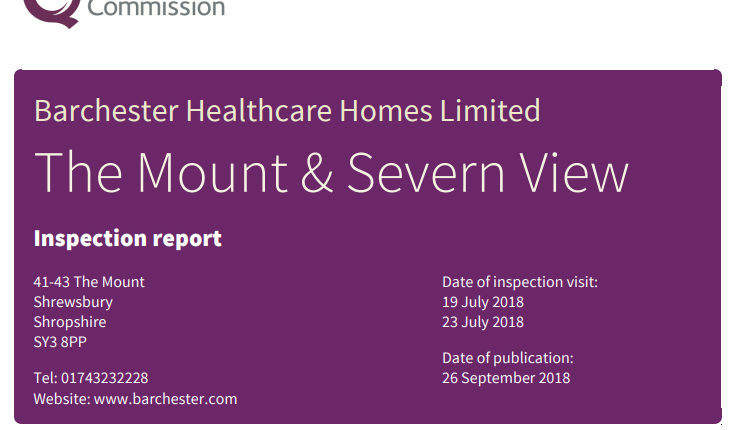 The Mount & Severn View, a 58-bed nursing home run by Barchester Healthcare, has been rated Requires Improvement by the CQC. The service in Shrewsbury, Shropshire, remained Requires Improvement after being given the same rating following an inspection in August 2017. While noting staffing numbers at the home had increased, the CQC said people still did not receive care in a timely manner. The CQC said that, while risks to people were assessed and minimised, environmental risks had not been considered. Inspectors found that people were not always treated with dignity and respect and, while complaints were investigated, the CQC said there was no system in place to address “informal grumbles”. While infection control measures were also in place, the CQC said malodours had not prevented in some areas. People were safeguarded from the risk of abuse and their medicines were stored and administered safely. The CQC added that the principles of the Mental Capacity Act 2005 were also followed to ensure that people consented to their care and support at the service. A Barchester spokesperson said: “We take the findings of the Care Quality Commission very seriously and we are in the process of developing a robust plan to address the issues raised. As part of this plan we are in the process of refurbishing the home to improve the bedrooms and all communal areas.